You might have seen that this week I started a fundraiser to raise funds to allow me to buy a new powerchair that is more suited to me. I've been speaking about how my current powerchair is unsuitable since the start of the year, tweeting about my journey with wheelchair services and my general sadness of being stuck with an unsuitable powerchair that limits my life instead of giving me more independence. 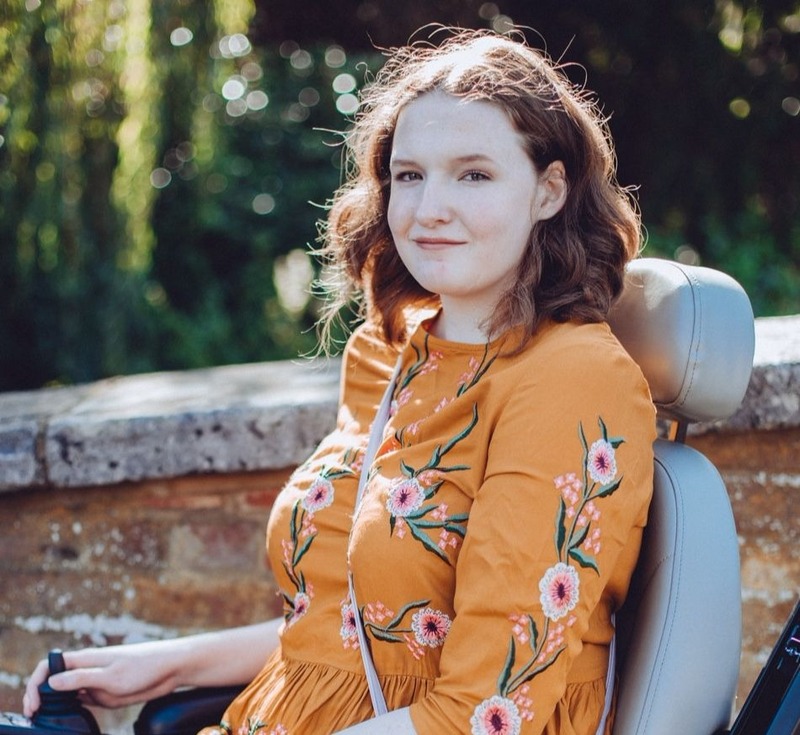 If you haven't seen those tweets you're probably wondering why I need a new powerchair though, my GoFundMe page explains it a little but I thought it would be good to go into more detail in a blog post. Last year I raised £2,000 to get me a small, basic powerchair that would open doors for me, after wheelchair services denied me help, and it did open so many doors. I was suddenly able to leave the house without the help of someone else, I got back so much independence. I could never have predicted just how quickly my health would decline though. The cyst at the bottom of my spine has caused me more and more pain since then, numbness as well and I'm now spending 90% of my day laying down, as that's the only thing that relieves my pain. My current powerchair has become something I dread sitting in though, often after just half an hour in it my pain reaches unbearable levels. The piece of equipment that was supposed to give me my life back is slowly taking it away. The seat is uncomfortable, the poor suspension sends vibrations throughout my body causing me pain and it has none of the functions or features that I so desperately need now. At the beginning it was perfect but my declining health means it's doing more harm than good now. I went to wheelchair services first, the NHS help that is supposed to be there for people like me but exactly like last time they said no, they couldn't help me. Simply because I'm able to walk a few painful metres on my crutches in my home, as though that's a practical way for someone to get around, a few steps at a time. I was frustrated and tried to fight it but found out through one of their wheelchair technicians that actually, it looked like they didn't supply anything that would be suitable for me anyway, the NHS only supply very basic chairs and none are small enough, but also powerful enough, to be ideal for me. I suppose that softened the blow of being told 'no' again but I was still frustrated at the broken system. There is still a small chance I might be able to get a voucher from them but it's not even likely to cover a quarter of the cost I'll need to pay for a new powerchair. So, I started doing my own research, for 6 months I've been going over just about every powerchair on the market in the UK to find something that fits what I need. I need something that will fit on the bus, fit in my families home as I stay there for London hospital appointments (and their front door is smaller than standard so this narrowed my options greatly), had a wide range of electric options, comfortable seating and the ability to be personalised to my measurements and adapted for if my health continues to decline. And let me tell you, it's not easy to find a powerchair that ticks all those boxes. It came down to 2 powerchairs in the end and I recently test drove both of them after doing intensive research and getting as many opinions as possible from people who owned the powerchairs. There was about a 3k difference between the 2 powerchairs so of course, I was hoping the cheaper one would be more ideal. Sadly, this was not the case. The cheaper one didn't support me in the right places, it didn't offer the full recline that it so necessary for me (as laying down is the only thing that makes my pain bearable) and it's suspension was far inferior to the more expensive model. On top of that the more expensive powerchair was far more recommended to me by fellow powerchair users. When I sat in the powerchair that I'm fundraising for the wheelchair technician commented on the smile that was on my face, I didn't even know I was smiling but I knew that I was too comfortable to even explain. I was tilted back, with my legs raised slightly and it was the first time in years that I felt comfortable sitting up. I can't even describe to you what that felt like as I honestly thought I'd never sit up comfortably again. I drove it around the area outside, marvelling at it's suspension and kerb climbing capabilities. 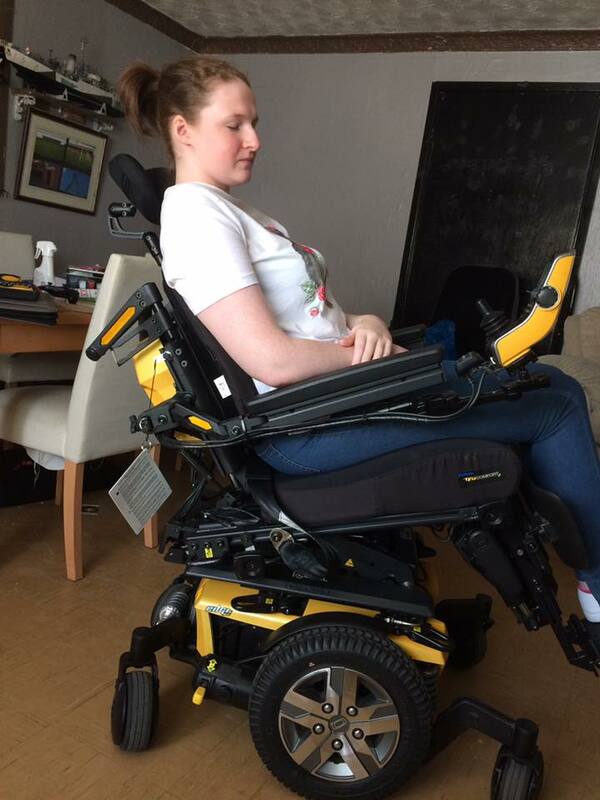 The powerchair even has a 10 inch raise function which brings me to eye level with people standing up, this will increase my social experience greatly and be practical for reaching things on high shelves, increasing my independence even further. It really ticks all the boxes so when I found out the price, my heart sank. 'I can't ask people for over 10k' I thought to myself, it felt like an impossible goal. All the electric functions I need added on thousands to the bill and the specialised seating, headrest and other changes to make it fit me like a glove weren't cheap either. I thought that was it, I would just have to be stuck in an unsuitable powerchair, becoming more and more housebound. I spoke to a few people, family and friends, and they all said go for it, they all said they would find a way to fundraise the money, that my health was too important to compromise on. So, that's how we get to here. I still have an awful lot of guilt though, I feel guilty that I can't afford to buy this myself, I feel guilty that I need such an expensive powerchair and I feel angry at my body and the NHS for letting me down. Honestly, I don't know how long it's going to take to reach my goal, we are nearly at 1.5k already, but it will be so worth it to get my life back. This powerchair might even allow me to return to education, something I've been longing to do ever since I was forced to leave after my GCSEs. If you can help at all, either by donating (even just £1 would make a difference!) or sharing my pinned tweet on Twitter then I would be incredibly grateful! The simply fact is, I will become housebound if I cannot raise the funds to get a new powerchair and that is a terrifying thought.